Click Tha Supah Latin is known as the beatbox king of the West Coast. An established MC and producer, we asked Click how he got into beatboxing, and where he thinks the art-form is going. I discovered Beatboxing one day listening to the radio. I heard The Fat Boys and I thought it was dope, Then I heard Doug E. Fresh with the Clicks and I was hooked. I’ve been at it since 1984. How has the current resurgence in beatboxing impacted on you? Well, I’m past my youth days so I’m not really out there tryin’ to battle everyone and their mama. Right now I’m just enjoyin’ My craft and just havin’ fun trippin’ people out with the stuff that I do. Also the big thing for me right now is being able to rock shows with my oldest and youngest son. It’s like reliving my youth with my kids….. It’s a dope feeling… ya know.. not having to describe how it was back when I was rockin’ shows and stuff, they’re seeing it live and first hand. As a beatboxer, how do you rate yourself? 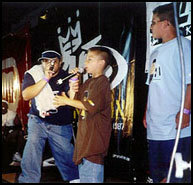 Who is your favourite beatboxer, past and present, and why? Probably the guy who really taught me a lot…Sha Sha. This dude was the dopest I heard when I was in high school. He’s who I got my style from. Even today I think he’s dope. They really didn’t show his dopest beats on the documentary “Breath Control”, He’s way better than that. I’m not disrespecting the old cats at all…I’ve just always loved hearing Sha Sha bust! He’s such a natural. He can hear a joint once and hit it like he’s been doin’ that beat forever. Where does the name 'Click Tha Supah Latin' come from? I said it in a rhyme once. I said, “ …a Supah Latin bringin’ fake M.Cs to their knees”. Then a friend of mine said to use it as a handle but I liked it better as part of my name. Plus, if you know everything I do: Beatbox, M.C, Produce, (240 lb) B-Boy, Radio Jock, Father, Husband, Coach (Football, Basketball, and Baseball), and some of these things I do on stage, then the name makes sense. With 2 hip-hop albums already under your belt, what are you currently working on? The third album. It’s called “Contact” and it’ll be my best work so far. Somethin’ a little different from the regular CLICK, and yes, there will be beatboxing on it! Do you feel, as a musical artist, that you have accomplished the goals you have set out for yourself? Yup! Honestly, I don’t need to go platinum. If this new album is my last, I aint trippin’. My life is and will always be my family. My accomplishments are cool, Something to show the grandkids later. For me to be one of the few known and respected Beatboxers in the world at this point is dope. Not many people can say that they’ve become known or somewhat famous for a specific talent. I thank God for that. Do you think all avenues of hip hop have been exploited? To some degree. I just really want people to acknowledge the real stuff… ya know? Let the world know where it came from. Let them hear Hip Hop at it’s rawest. Appreciate what it has done to spark interest in other genres of music. Hip Hop influenced the youth to take interest and to listen closer to jazz, rock, soul, etc; which evolved into the appreciation of those different types of music. Hip Hop has literally revived dead careers. With the new generation of beatboxers, do you think that the public willappreciate beatboxing as an art-form in its own right? A little. Heads always will though. In a way I care…but then in a way I don’t. Reality is that people in powerful places will exploit it if it brings in the dollar. If it doesn’t well then it gets no respect. I intend to still be performing in the next 20 years. I know the real heads will always show up. I won’t shut out the mainstream public though. If you think about it, we were all mainstream at one point or another before Hip Hop. There’s still hope. What feeds you most about beatboxing? What gets you most excited aboutdoing the art form? What do you think of the beatbox scene right now both in the US and theUK? 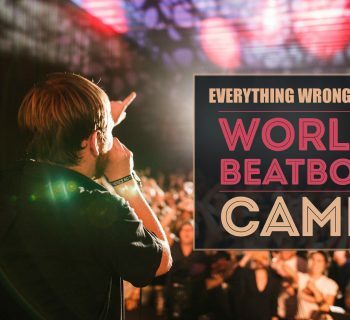 The Beatbox scene is doper in Europe than in the U.S. Of course more people here have become more famous than those in Europe but the hunger for the true art of Beatboxing and the Hip Hop culture has to go to Europe. I think what I like the most is that it has spread so far and that there’s an interest in it by all. I’ve heard very little of Kela but I think he’s dope. Of course Rahzel, Kenny Mohammad, D.O.A., but I know that someday there’s gonna be someone that just takes it so far that a lot of us won’t be able to catch up, that’ll be dope! 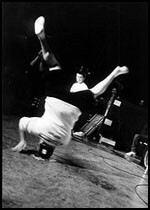 What is the biggest gig you've beatboxed at? The Cypress Hills “Smoke Out Tour”. I only did it once with Jurassic 5 and it was dope. I’ve never performed for that many people before. Standing on stage and seeing nothing but people. WoW! I actually got more props than they did in the L.A Times. That made me feel good. How are you able to maintain such a deep kick and snare while humming,ie. during your 'Push It' routine? I’ve really tried very hard to master Breath Control. I’ve noticed that when people try to do double sounds they always lose a little something in the kick and snare. I practice the intensity in the kick and snare always. I notice that a lot of Beatboxers try to be loud, which is cool, but if your too loud it’s hard to do double or triple sounds at once. You have to find the middle zone where you are loud enough to please yourself and at the same time not be too loud where you can’t pull off your tricks. That’s where breath control kicks in. With me, if it takes weeks to finally get it then so be it. There were times before when I thought I was dope during a set but later seeing it on tape, realized it wasn’t as I thought. During the 'Push It' routine, how do you do that old-school shaker soundover the beat? It’s panting (like a dog) except with your mouth closed. Then moving the sound to the back of your throat where the snoring sound occurs. You have to keep it airy though. What's in your CD player at the moment? Chris Rice’s “The colour 9” album . He’s a Christian singer/songwriter/youth pastor. Finally, what's your favourite colour?